We are a Tulsa church with the mission of bringing complete restoration to the life of all individuals. Our mission and goal is to create a genuinely, warm and welcoming atmosphere that promotes real and true hope and not false security. Where people from all walks of life can feel the true love of God and his children. To uplift, encourage and inspire all by spreading the gospel and the love of Jesus Christ. Restoration Church “Help For Hurting People” will be exactly that. A place where hurting People can find refuge. Where all can receive healing physically, mentally and spiritually. We will accomplish this through prayer, teaching and educating, overseas ministries, community outreach, church events and simply loving individuals where they are. We want to perpetuate an atmosphere where the seasoned elders can coexist with ambitious young adults and small children. All the while developing, mentoring and inspiring the youth, loving and encouraging the elders (who paved the way before us) promoting family values and producing the next generation of leaders. We will stand and operate on biblical principles and follow the Holy Spirit. We will be a community for all cultures and people from different walks of life to encounter the full experience of Christ’s love. We believe the Old and New Testaments are inspired and sufficient guides for salvation, Christian worship and service. We believe you are saved by grace through faith, apart from works. Come worship with us through song, dance, poetry, art and however the spirit encourages you to give thanks and praise to God. To equip saints for the work of the ministry through the “Five-fold Ministry Gifts”. To provide new converts with care and foundational teaching, that they might be baptized in water, in the Spirit and become a productive member of the Body of Christ. To reveal our love for the Lord Jesus Christ by ministering spiritual and practical assistance to the poor, widow and single mothers. To demonstrate through covenant relationships the character and love of God by serving, honoring, encouraging, admonishing, and caring for one another. To build strong marriages and families. To pursue excellence in all we undertake. Restoration Church has supported mission work in the Philippines for over 20 years. 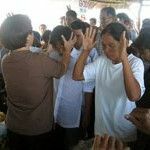 We are involved with several churches, feeding programs, and evangelism programs in the Philippines. Pastor Romon and others travel to the Philippines periodically to teach and minister and help establish the local churches.